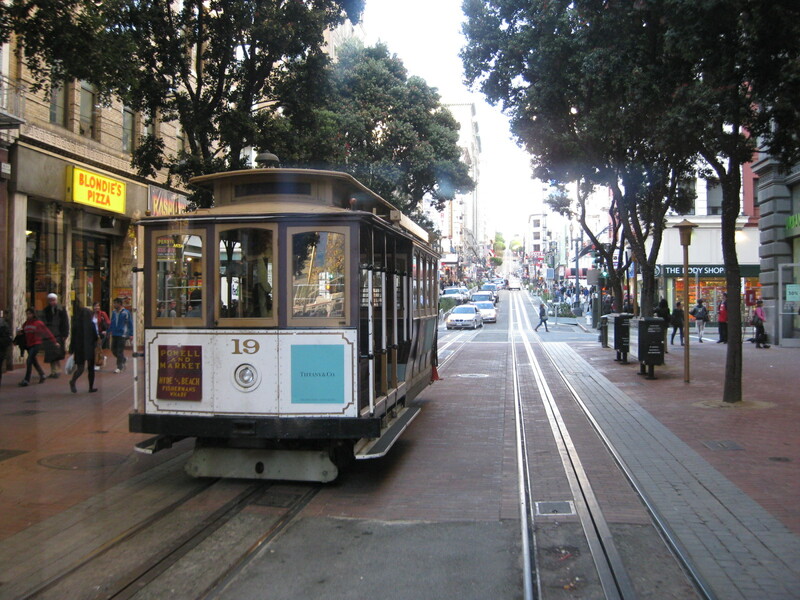 Part of the experience of traveling to and staying in San Francisco, CA was taking public transportation in that city. 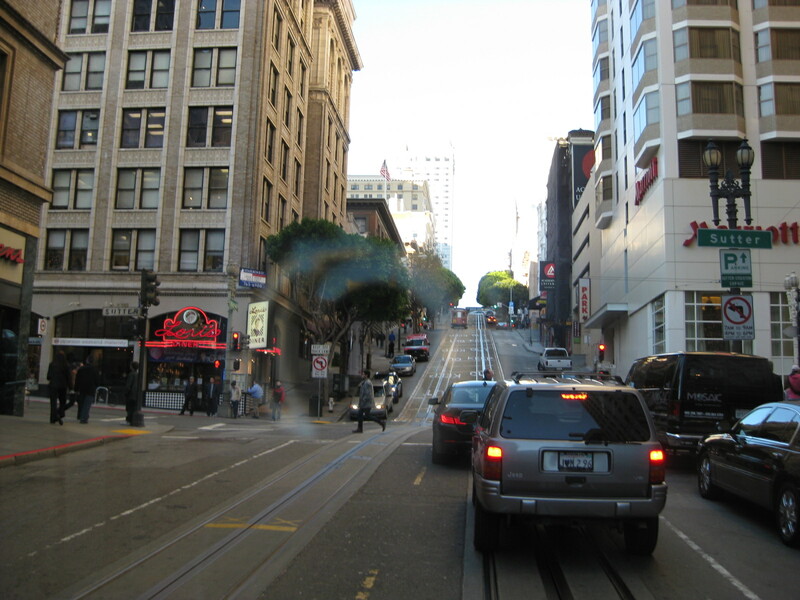 The public transportation system in SF is probably among the best I’ve used considering the layout and character of the city and it prides itself with what they term as “museums on the move.” The city’s transport system consists of electric trolley buses, hybrid and natural gas buses, LRT’s, electric street cars and its most famous cable cars. 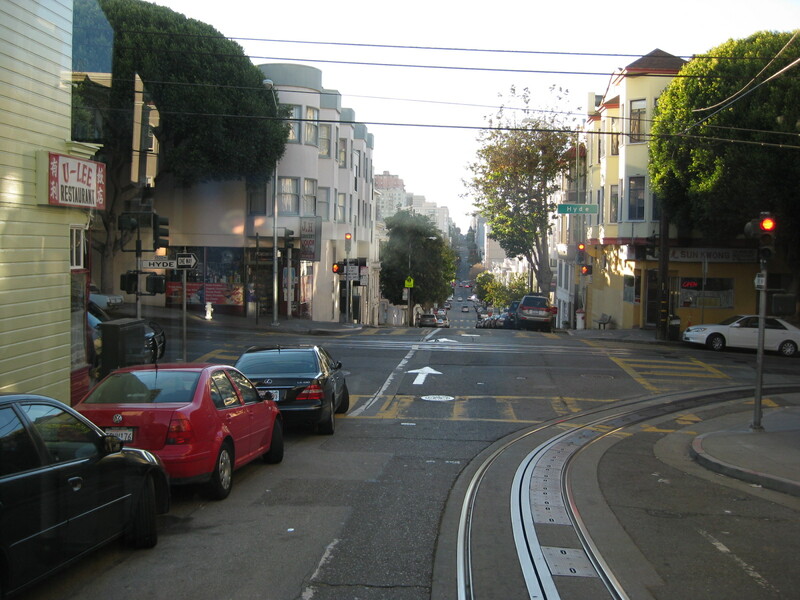 There is also the Bay Area Rapid Transit (BART) that passes through the city and connects it with the other cities and counties in the Bay Area. 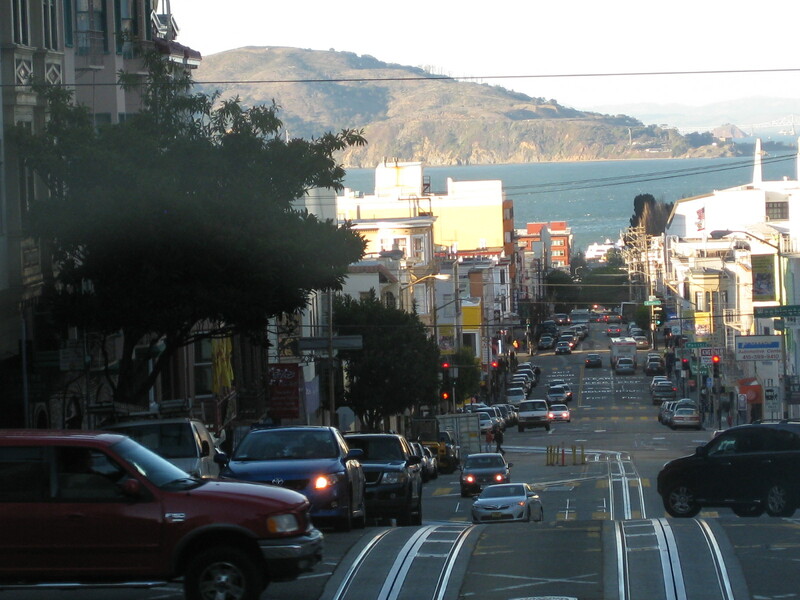 For transport in the SF, it is highly recommended that one take the 3-day or 8-day pass depending on the length of stay. In our case, we purchased a San Francisco City Pass that included unlimited use of municipal public transport (buses, light rail, street cars and cable cars) as well as entrance fees for museums, the California Academy of Science, and a cruise of the bay. 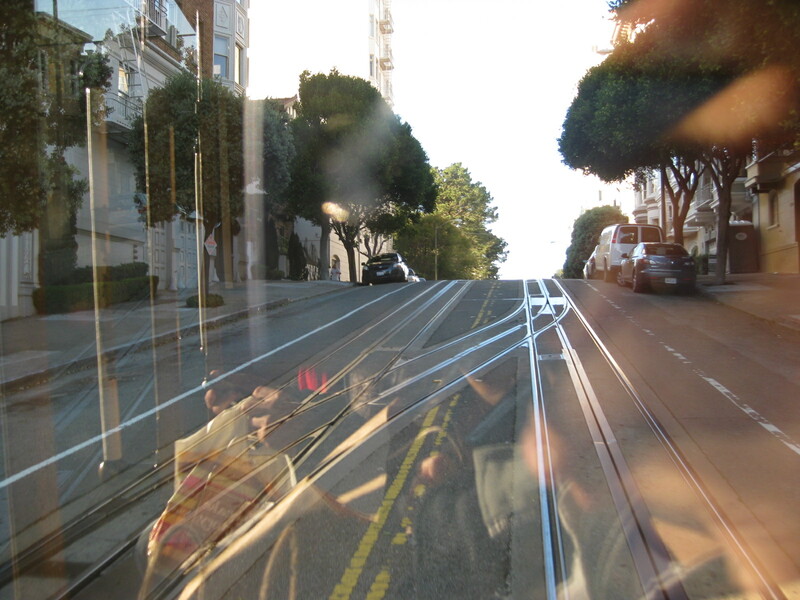 Following is a photo journal of one of our many cable car rides. 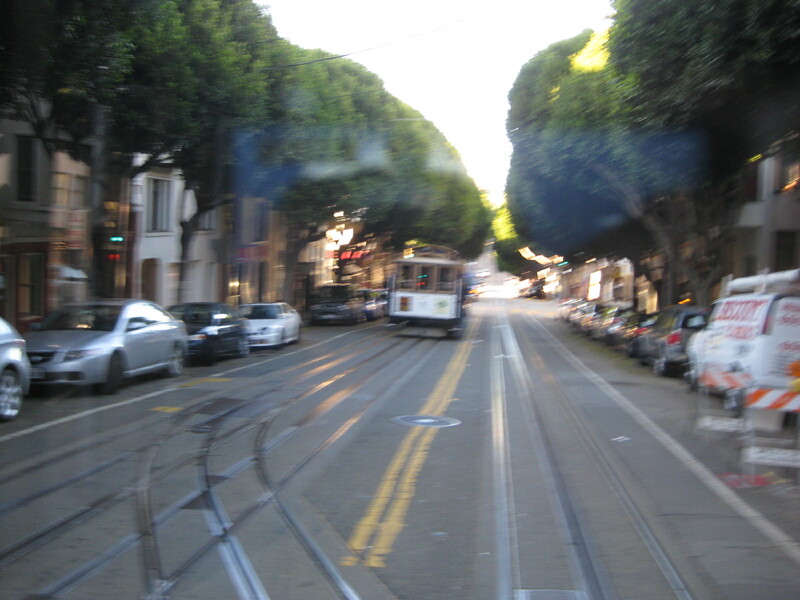 The photos show a particular journey aboard a Powell & Hyde cable car from Market Street (near Union Square) to Hyde Street (near Argonaut Hotel). 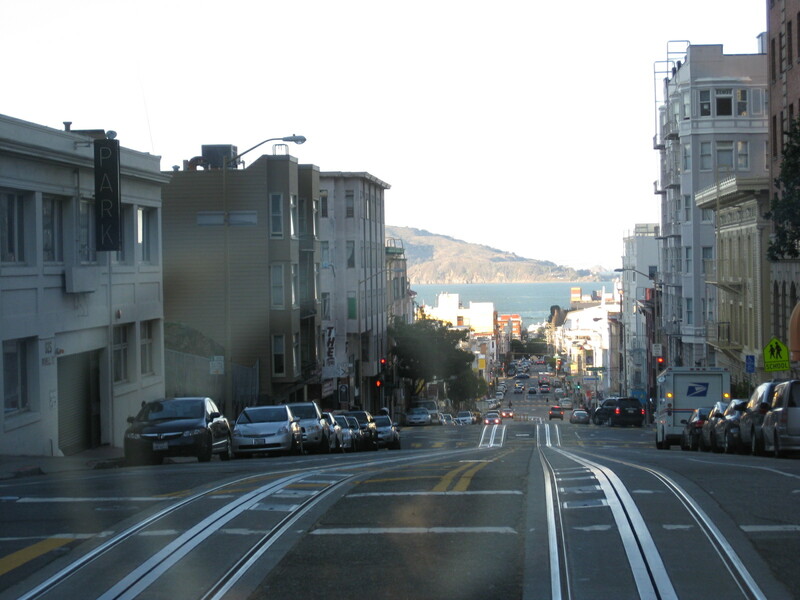 The trip takes one through notable spots like Union Square, Chinatown, Nob Hill and Russian Hill, including a stop at Lombard Street that has that famous crooked section popular with tourists and residents alike. 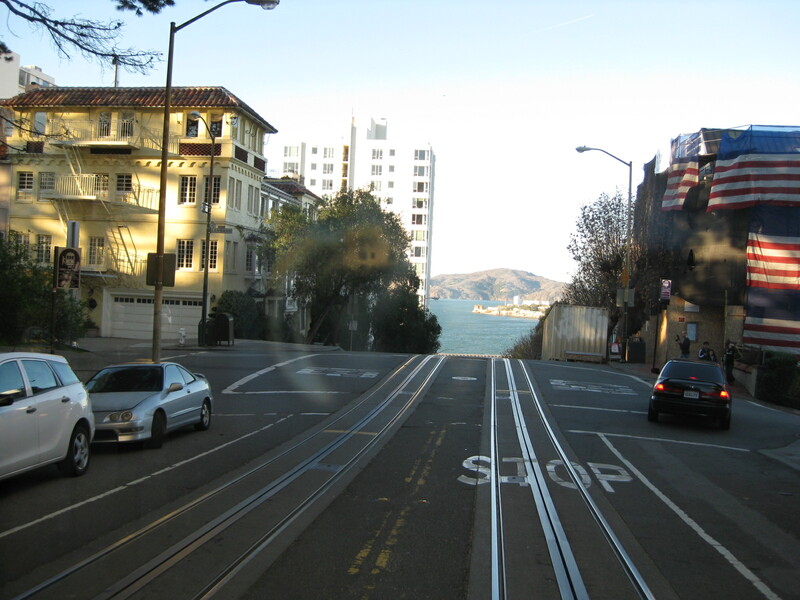 There are also breathtaking views of the bay as the cable car descends towards Mason or Hyde Streets, towards the pier. The trip will pass through Powell Street, which is lines with many shops, restaurants and hotels. To the right is Union Square famous for its Christmas Tree. However, there is that monument at the square that people tend to take for granted. Filipinos should be aware that it is one commemorating the victory of one Comm. Dewey and the US Fleet over Adm. Montojo and the Spanish Fleet in Manila Bay back in 1898, a significant part of Philippine and American histories. Borders closed shop but there are many other shops and stores in downtown SF. 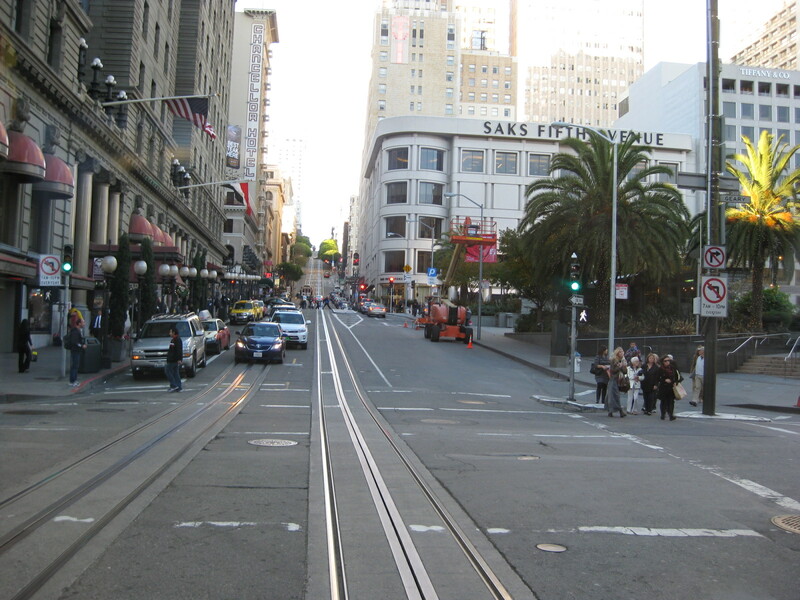 During one part of our stay, we regularly walked the stretch from Market to Sutter Street. This assures one of a good exercise, especially the uphill part of the walk. 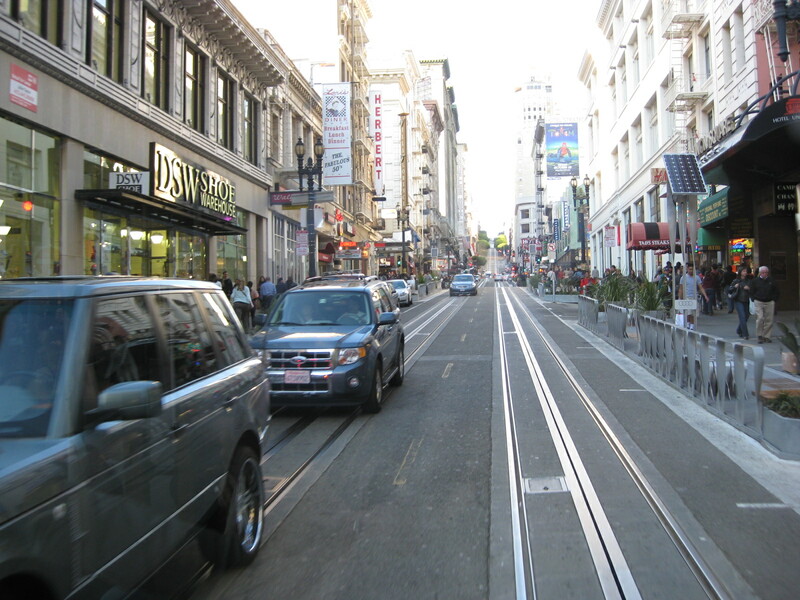 Cable car descending towards Sutter Street. 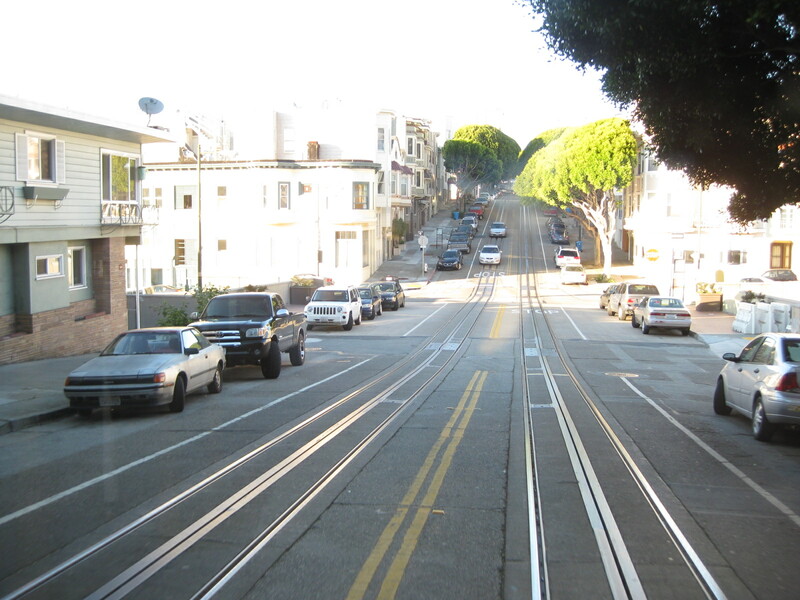 Note that each cable car seems distinct from another. Notice the tourist hanging on on the left side? She’s also taking photos along the way. 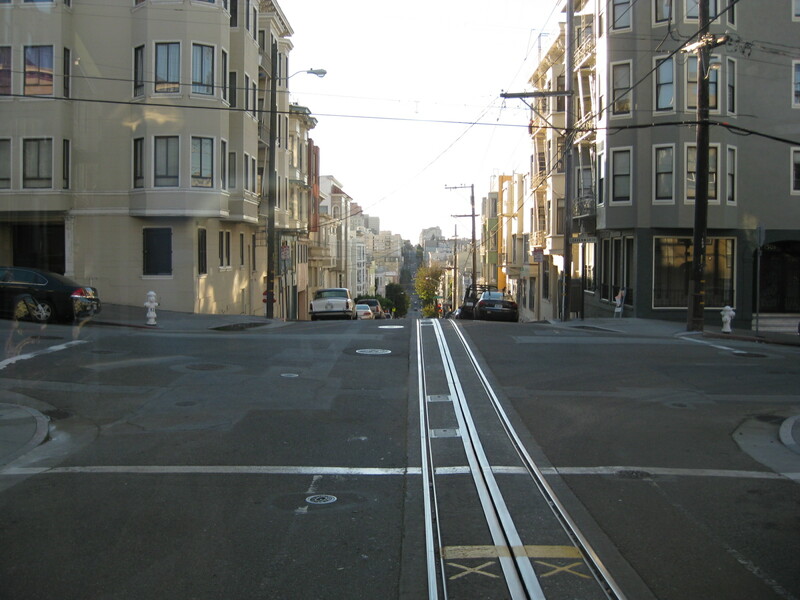 Pavement markings delineate where vehicles may park or travel and there are special markings designating the path of cable cars. In the horizon, one can already get a preview of the excellent view of the bay. 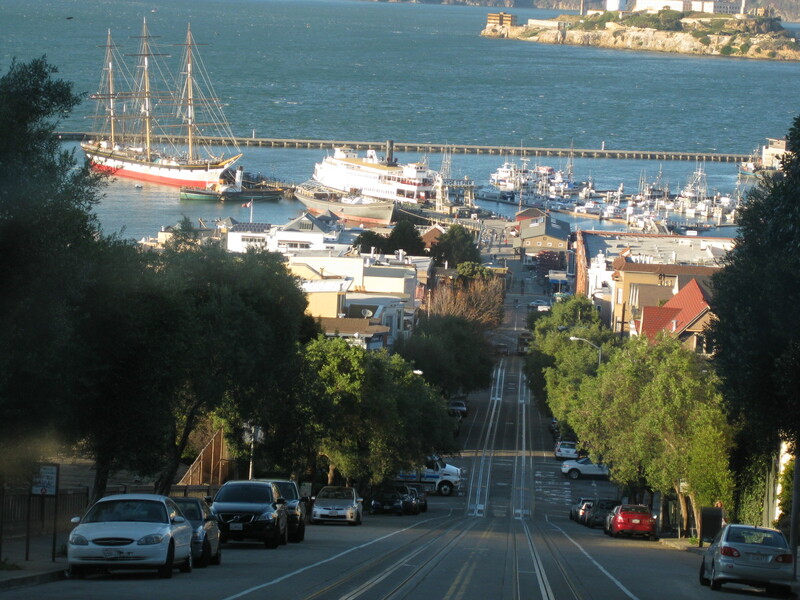 Descending towards the pier, whether towards Mason Street or Hyde Street, provides passengers with a breathtaking view of the bay. The topography in this part of the city is quite unique and travelers get an excellent vista. 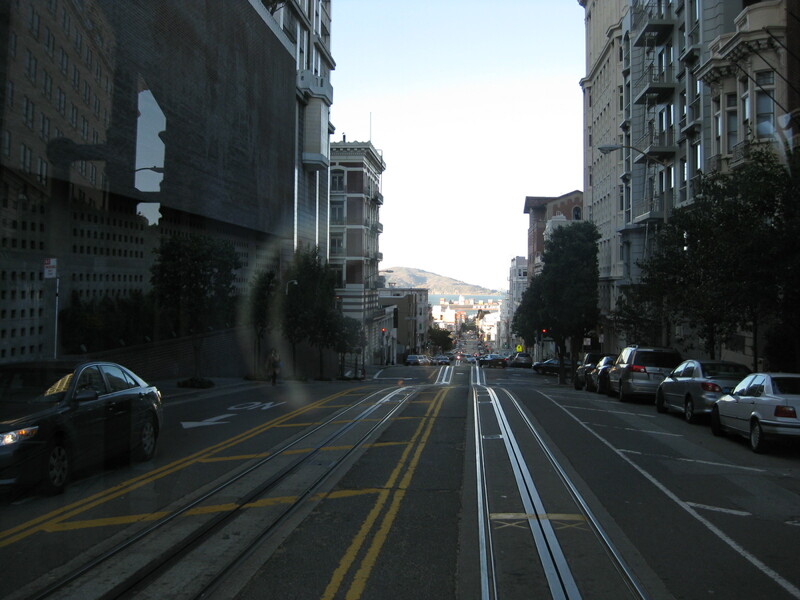 Cable car rounding a curve – there are two lines emanating from Market and Powell, one goes to Mason Street and the other to Hyde Street. 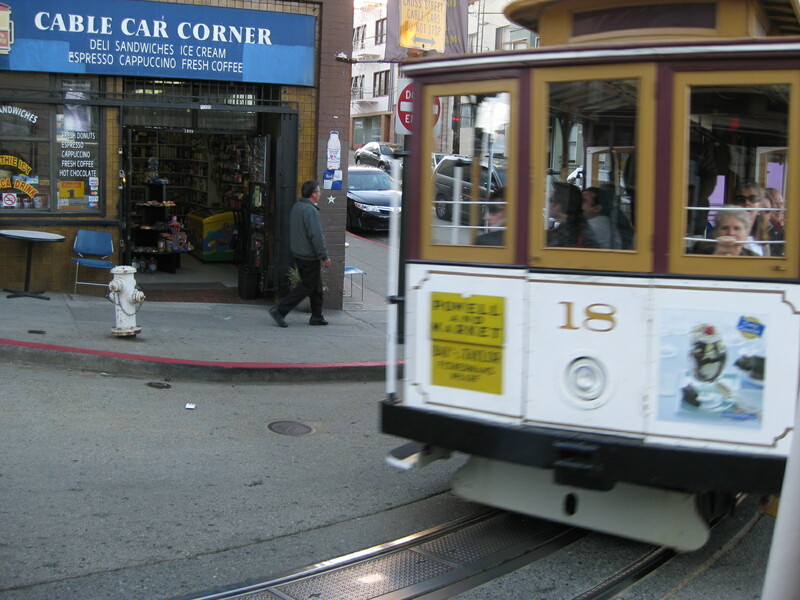 These are clearly marked on each cable car for the guidance of passengers. 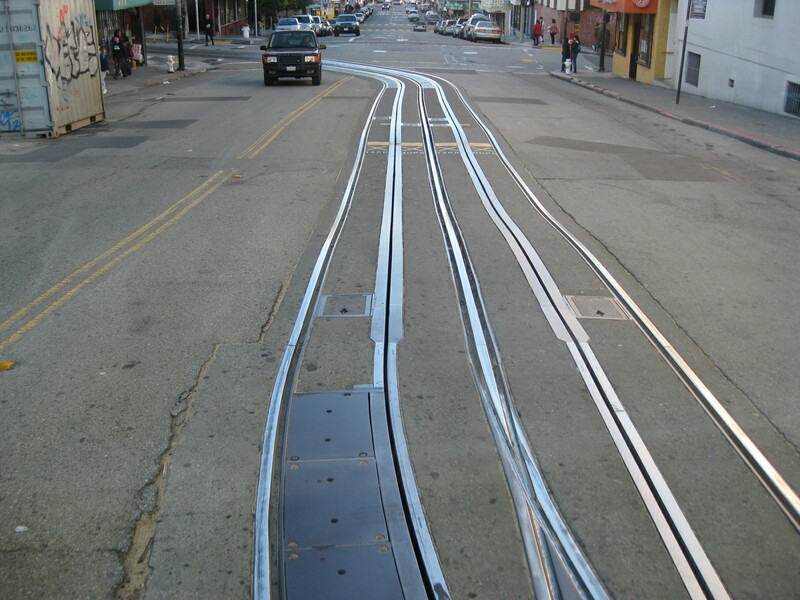 A close-up of the rails – the slot between the tracks are where the underground cables run through. 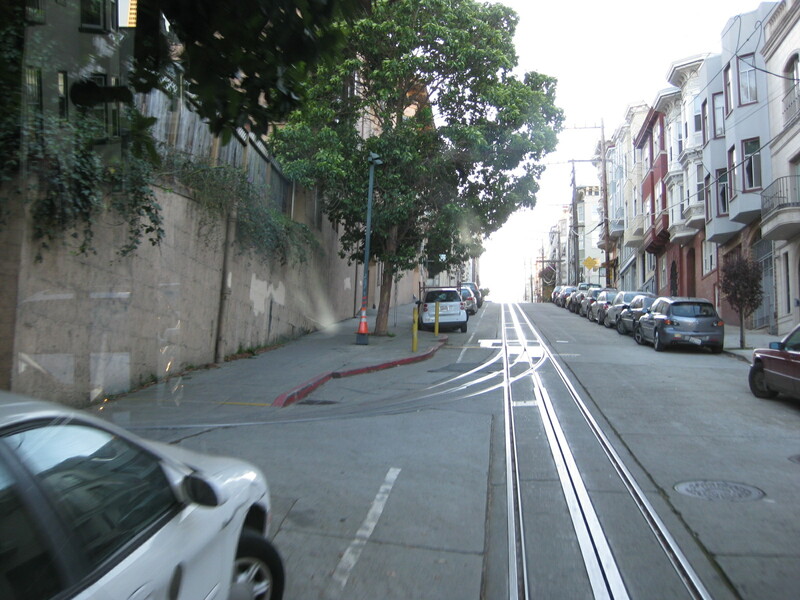 The topography assures us of many steep climbs necessitating the cable cars in the first place. The designer happens to be a mining engineer. The route runs through many residential areas. 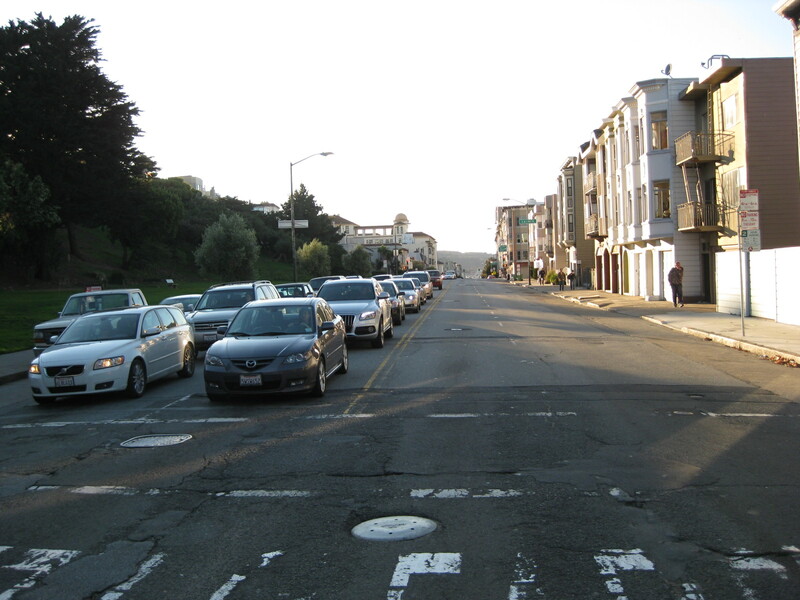 That’s Mason Street ahead where the Powell & Mason cars will turn right towards the Pier. Our Powell & Hyde car will go straight and turn at Hyde. 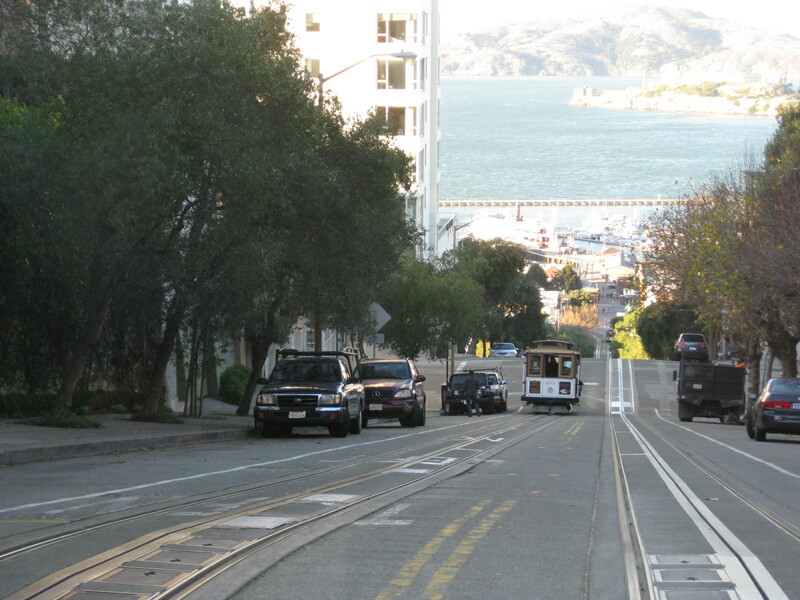 The rail coming from the right are from the Cable Car Museum, which is along the Powell & Hyde route. 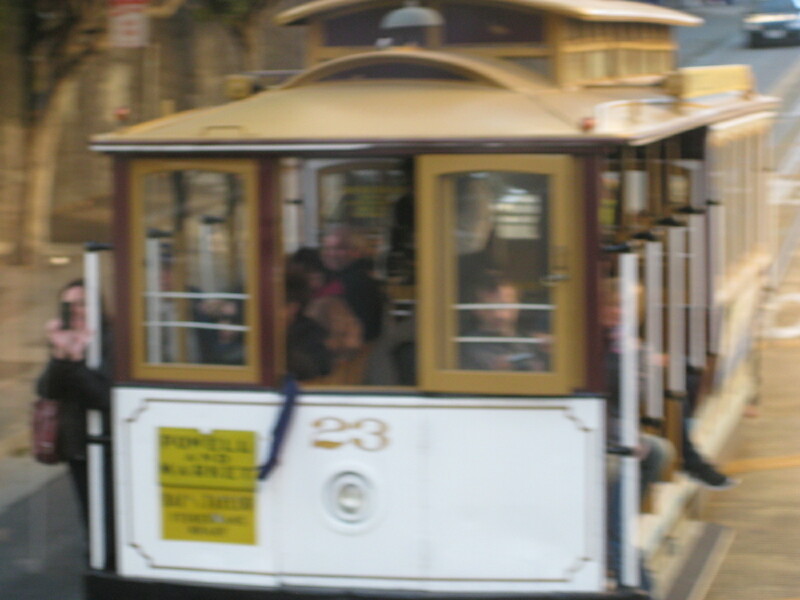 It features real, functioning cable cars as well as typical museum stuff that tell the story of this system. A typical intersection along the route. That’s Hyde Street ahead and the final turn towards the Pier. A closer look at the curve and the traffic signal. Cable cars follow the signals though I thought at first they were given priority over motor vehicles. A tree-lined section of Hyde Street. The cable car on the opposite side is filled with passengers. 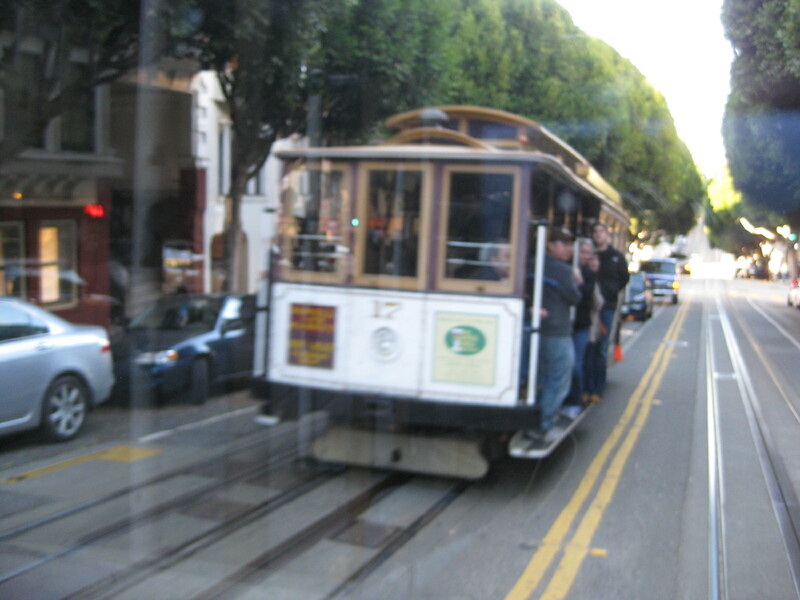 Most of those hanging on at the front portion of the cable car are tourists. Crests and sags are quite common in SF given its topography. The cable and rail designs allow for switching between tracks. 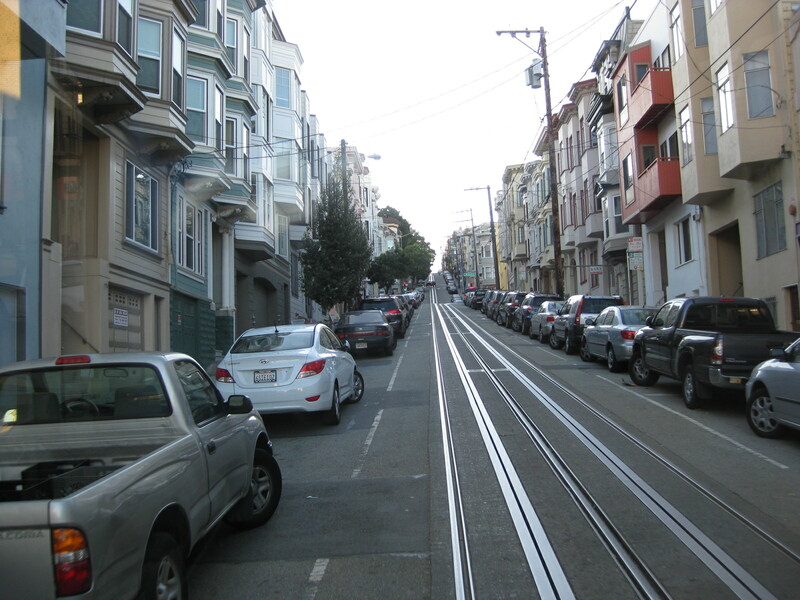 Lane markings designating the path of the cable car – the double yellow (no overtaking from either side of the road) is seriously enforced in San Francisco. 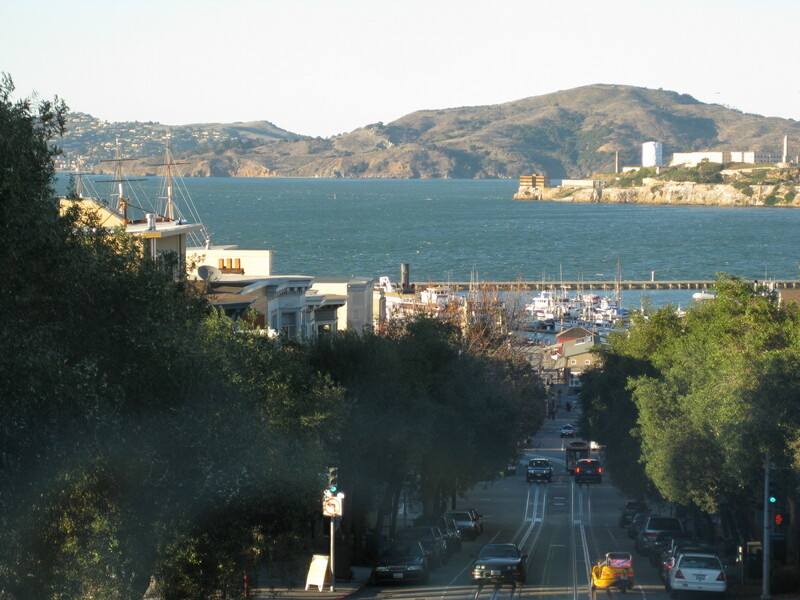 Again, the passenger is afforded a preview of the spectacular view of the bay towards the end of the journey. 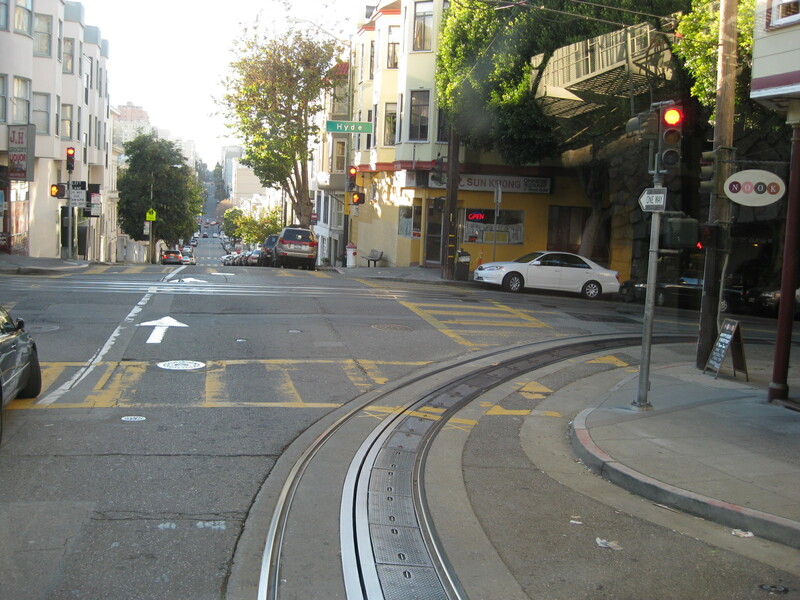 This is the stop at Lombard Street, famous for being the crookedest street in the world. The crooked section is at right starting from the corner with the American flag-inspired tarps covering construction work on one building. 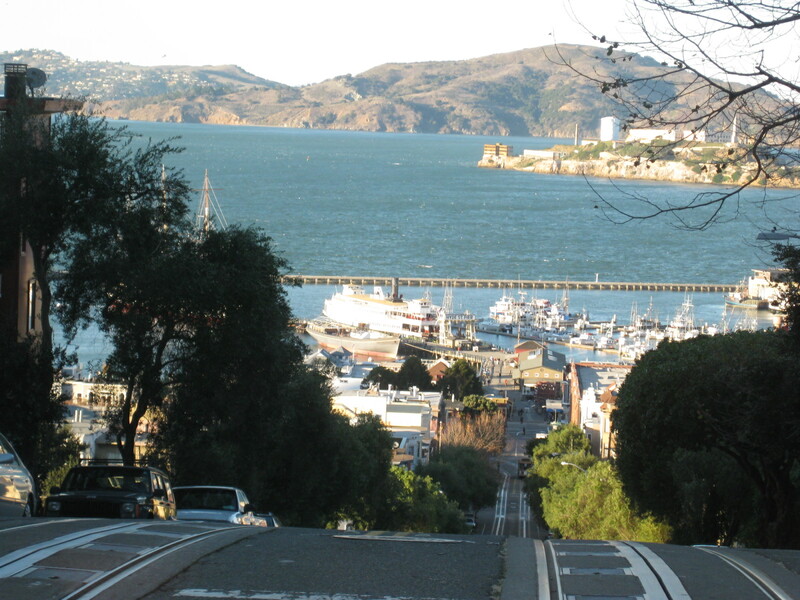 Descent from Russian Hill and Lombard Street presents a highly anticipated view of the bay and harbor. Ships and boats docked and with the Maritime Museum can be seen along with Alcatraz Island, the former prison. 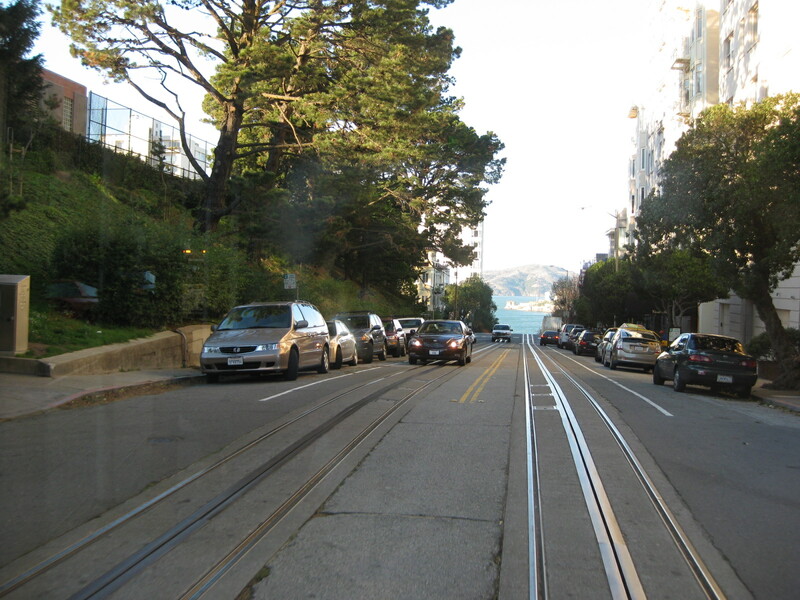 It’s a steep descent from Russian Hill but the cable system and the skillful drivers ensure a safe journey. Yes, that’s a cutter with its sails on the left side of the photo. It is part of the SF Maritime Museum along with other ships and boats regularly visited by school children on educational tour. Another view of the bay with Alcatraz on the upper right of the photo. 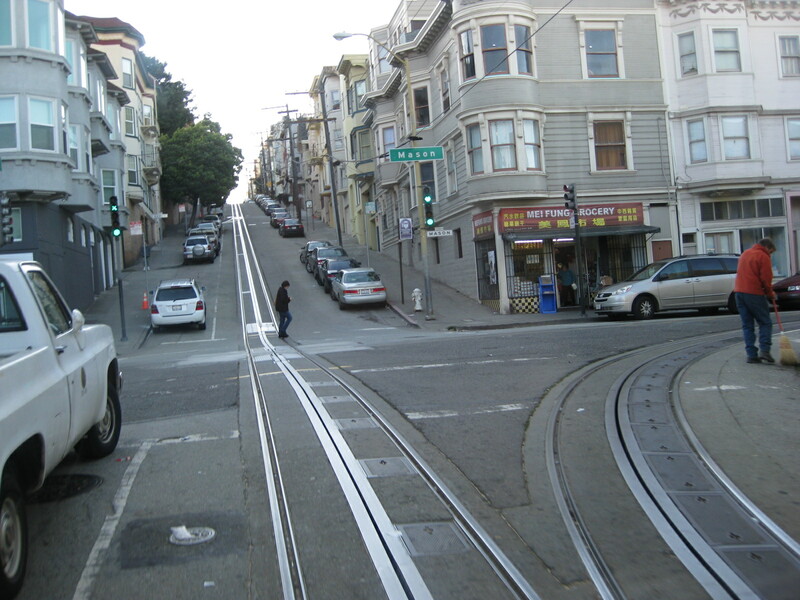 A view of a side street – many cable car stops are on in the middle of intersections. 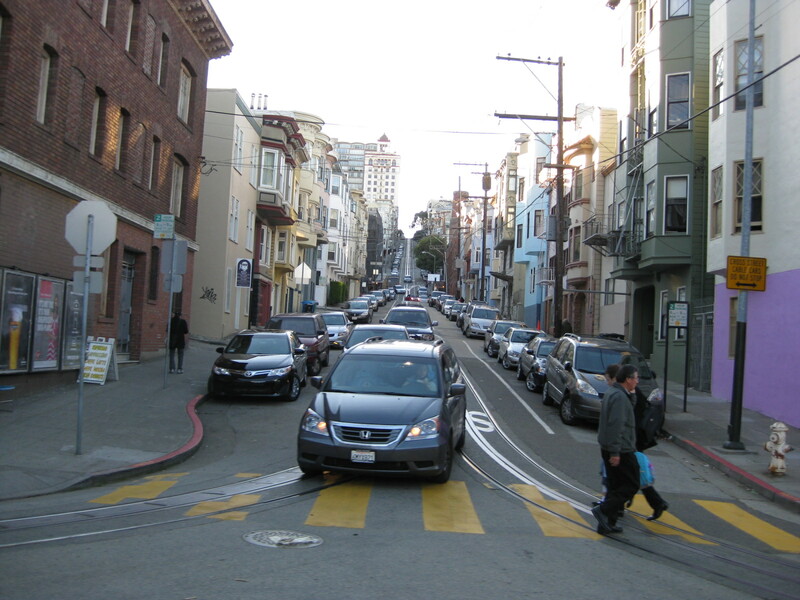 This is because the intersection is usually on even ground to facilitate the flow of vehicles, particularly turning movements. 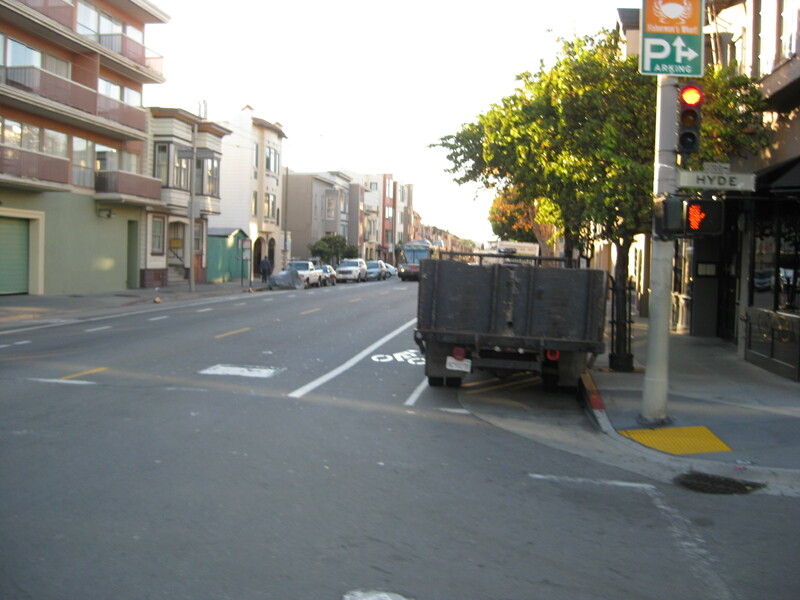 Another side street along Hyde – I took the photo not because of the trailer but because of the sign stating that roadside parking is allowed, and the pavement markings designating bicycle paths. Final stop – cable cars queue on the right side as they wait for their turn to go to the terminal where there is a turntable that enables cable car operators (There is always 2 – the driver and the conductor/brakeman.) to turn the vehicle around for the return trip. 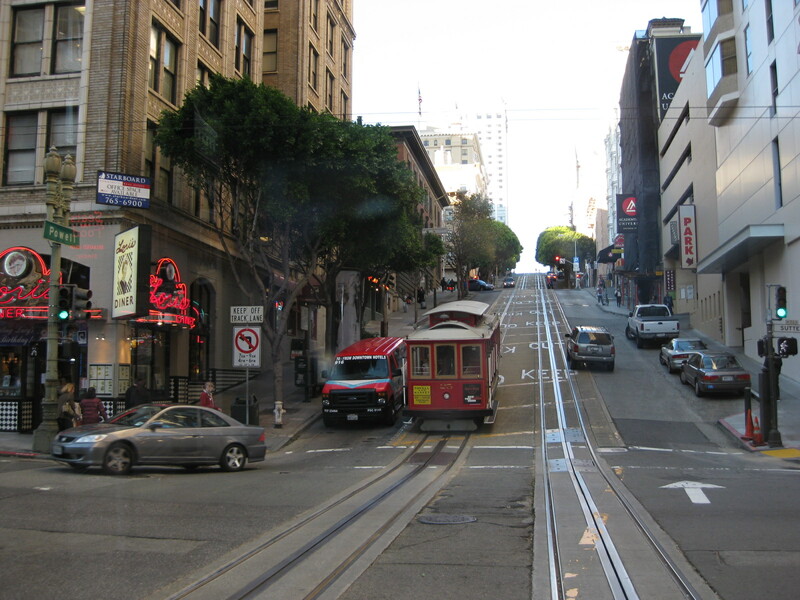 Note that the cable cars are not tourist transport as some people might see them. 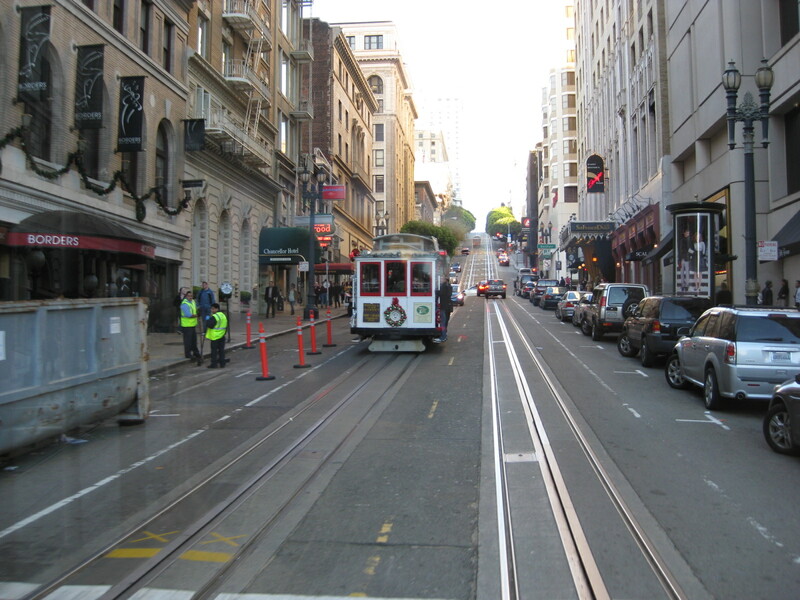 They are part of a very functional and efficient public transport system and there are people who regularly use the cable cars for their commute. 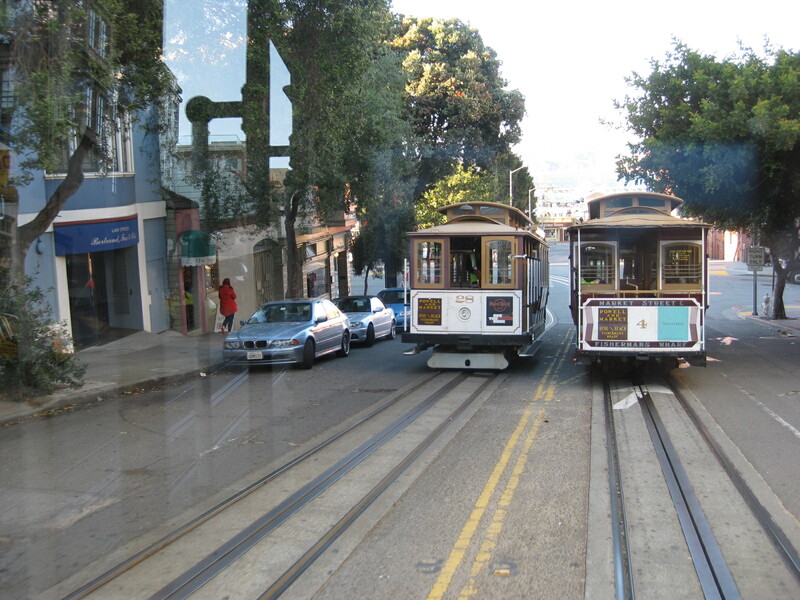 In fact, I spotted many who have passes for the cable cars, which have more expensive fares (US$ 6 per ride compared to the US$2 minimum for the trolley buses). By d0ctrine in EST, Public Transport, Railways on December 8, 2011 .